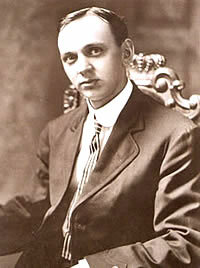 Edgar Cayce (March 18, 1877 – January 3, 1945), known as "The Sleeping Prophet" and "America's Greatest Mystic", is one of America's famous psychics. He wanted people to think of him as a healer and not a psychic. Cayce worked in a trance. This means he could talk while sleeping and answered questions about a person's health, past and future. This information is called "readings". At first, these readings were about the physical health of the person ("physical readings"). Later, there were readings on "past lives", "business advice", "dream interpretation", and also "mental or spiritual health". The Association for Research and Enlightenment (ARE) currently takes care of all of his readings and follow-ups to the readings. The readings have had a large effect on New Age thinking. Edgar Cayce was born on March 18,1877 near Hopkinsville, Kentucky. He read the Bible many times starting when he was 10 years old. He wanted to tell people about God and heal them. His family worked on a farm. His family moved to Hopkinsville in December, 1893. Edgar's first jobs (1894 – 1898) were at Richard's Dry Goods Store. He next worked in Hopper's Bookstore. Both stores were located on Main Street. He married Gertrude Evans in 1903. In 1900, Cayce went into business with his father. They sold insurance. Cayce became very sick with laryngitis in March. In April 18, he could not talk at all. He had to live at home with his parents for almost a year. He became a photographer because it did not require talking. He worked in the photography studio of W. R. Bowles in Hopkinsville. A hypnotist and entertainer called Hart was entertaining at the Hopkinsville Opera House in 1901. He heard that Cayce was sick and asked if he could try to cure him. Cayce said yes and the entertainer tried to cure Cayce in front of an audience. Cayce was able to talk while in a hypnotic trance but when he woke up he could not talk. Hart hypnotized Cayce so that his voice would be normal after the trance but Cayce's voice did not become normal. Hart had to leave. Another hypnotist, Al Layne, continued to help Cayce have a normal voice. Layne asked Cayce to tell him the cause of his illness and it's cure while in a trance. Cayce described his illness from a first person plural point of view – 'we' – instead of the singular "I." In later readings, he would usually start off with "We have the body." In the reading, Cayce said his voice loss was because of psychological paralysis and that could be fixed by increasing the blood flow to the voice box. Layne suggested that the blood flow be increased and Cayce's face turned red with blood and his chest area turned bright red. After 20 minutes, Cayce, still in a trance, said the treatment was over. When he woke up his voice stayed normal. He would get sick again, but was cured by Layne in the same way and later he was cured perfectly. Cayce's work grew as his fame grew. He asked for people to give him money to support himself and his family so that he could work full-time. He continued to work in a trance state with a hypnotist all his life. His wife and oldest son later replaced Layne in this role. A secretary, Gladys Davis, took notes. Many believe that Cayce had an affair with Ms. Davis later in life - but a medical examination conducted after Cayce's death to treat Davis's uterine cancer allegedly showed that she was still a virgin at that time. In 1929 the Cayce hospital was created in Virginia Beach. The cost of the hospital was paid for by Morton Blumenthal, a New York stockbroker, Cayce hospital benefactor. Cayce became famous in the United States in 1943 because of an article in Coronet magazine. He increased his readings to 8 times a day to try to keep up. This caused problems with his health. The trance reading caused problems with Cayce’s health which were easily seen. On the times when he could not give a clear reading, he said it was because he was working under too great a pressure. In these cases, he always gave the money back to the person he was giving a reading to. Edgar Cayce died on January 3, 1945. He had predicted his own death four days earlier. Edgar Cayce is famous for the thousands of "readings" that he gave while he was hypnotized. He gave more than 14,000 readings in 43 years. Gladys Davis, his assistant, recorded the readings and his wife, Gertrude Evans Cayce, guided him during hypnosis. In the beginning, his readings were known as "physical readings" (health readings). Cayce often called the body "the organism". Cayce would put himself under self-hypnosis. While he seemed to sleep, he would say where the person was. He would sometimes name the streets along the way. He would then say "Yes, we see the body", and describe the client's organ, circulatory, and nervous systems. He would give reasons for illness or problems. A message would then be given to the person telling them how to get better. The readings were so specialized that treatments were often changed, or not even given, if the person would not follow his advice. People often came to Cayce for health readings when the medical community could find nothing wrong or had given up on them. In a life reading, Cayce described the "past lives" of the client. These readings described the client's present physical, emotional and mental condition in terms of past life experience. Cayce was not above flattering his clients by describing past lives as royalty, famous people, or people at their "spiritual highest". For those people whose intentions Cayce believed to be "pure", Cayce would give business readings. These included advice on business partners, the stock market, and business models. Cayce also founded and guided the A.R.E..
Edgar Cayce encouraged everyone to interpret and use his or her own dreams in day-to-day life. A dream reading involved Cayce interpreting the dreams of clients. As he did with readings on many subjects, Cayce would often interrupt the person reading the dream and give an interpretation before the dream had been completely read. He would sometimes fill in parts of dreams that the dreamer had supposedly forgotten. Unlike Jungian or Freudian dream interpretation, Cayce did not emphasize highly the importance of symbols. He said that every individual has his or her own unique symbols. Cayce claimed that in dreams people could receive valuable insight into their own lives and that the insight was always of use to the dreamer. Besides regular daily insight into one's life, he claimed people could communicate with loved ones dead or alive, remember past life experiences, see a possible future and experience many other psychic phenomena. He stated that these paranormal abilities were something anyone could learn. These readings were often short and were Cayce's favorite type of reading when not in his supposed trance state. They focused on what an individual could do to achieve a better mental/spiritual life. Other Readings are miscellaneous subject matter that does not fit into an above category. The subject matter differs from missing persons, buried treasure, readings given to a spiritual development group, psychic abilities, auras, prophecy, structure of reality, geology and many other topics. For many people, the readings had a powerful impact on attitudes, beliefs, health practices, outlook on life, matters of faith and many other areas. Cayce himself did not claim to be able to do all these things. Cayce had difficulty in believing some of the things he said when he was hypnotized. For example, having been raised a devout Christian, for a long time he could not believe that reincarnation was real. Books such as Frederick Oliver's A Dweller On Two Planets and Marie Corelli's novels were probably easily accessible to Cayce at his bookstore. Corelli's writings in particular seek to reconcile mystical beliefs such as reincarnation with Christianity, and Cayce may have been subconsciously trying to accept this idea. Cayce also claimed while in a supposed trance that the Essenes had believed in reincarnation but that view was expunged from the Bible following a papal council decision in around 500 AD. Essene belief in reincarnation is debatable, as with ancient Egyptian religion. During a hypnosis session, Cayce mentioned a former life as Ra Ta, an Egyptian healer-priest. He told a long story about working with the legendary doctor-magician Hermes-Thoth, who he said was reincarnated as Jesus. Cayce also specified that Jesus had lived a number of incarnations throughout human history. Melchizedek, priest of Salem who blessed Abraham. Joseph, who was sold by his brothers as a slave. Joshua Son of Nun, right-hand man of Moses. One of Cayce's trance statements implies that knowledge gained through his readings is not necessary if a person is well grounded in one's faith: "Does it make one a better husband, a better businessman, a better neighbor, a better artist, a better churchman, if so cleave to it, if not reject it." The readings also warn against the misuse of religion for personal gain. 'God is not mocked' is an often quoted verse in the readings. Many skeptics say that Cayce did not have paranormal abilities. Cayce himself said that not all the information given during "readings" was correct and should be analyzed. He criticized his own organization, the A.R.E , on a number of occasions for not doing enough research on the validity of the readings. In addition, although Cayce's secretary Miss Davis allegedly took down what Cayce said, the records of the readings are jumbled and chaotic. There is nothing to distinguish what Cayce himself independently said, what was the information provided in the letters, and what his handlers – physicians, osteopaths and hypnotists – told him. Thus, researchers cannot say that Cayce ever made an accurate diagnosis without knowing anything about the person at the other end. What is known is that by the time he got some of the letters, the client had already died. Yet Cayce went on with his reading for the individual as though still alive. Many of his health readings prescribed cures with ingredients that did not exist. Others were folk remedies, some well known to today's herbalists and naturopaths, but Cayce would sometimes describe them using terms that had fallen out of general use. Still other ingredients were completely unknown to either physicians or herbalists. Some were completely worthless; for example, Cayce once recommended breathing the fumes of apple brandy from a charred keg to cure tuberculosis. The many Cayce readings would later become commonly known practices of the New Age movement. In 1931 Edgar Cayce founded the Association for Research and Enlightenment, Inc. (A.R.E.) headquartered in Virginia Beach, Virginia. Today there are Edgar Cayce Centers in 18 other countries throughout the world. Wikimedia Commons has media related to Edgar Cayce. This page was last changed on 13 September 2018, at 20:19.